These Chocolate Cupcakes are super moist and topped with a rich and decadent chocolate buttercream. Made with an adapted cake mix recipe, they’re easy to make and perfect for parties! 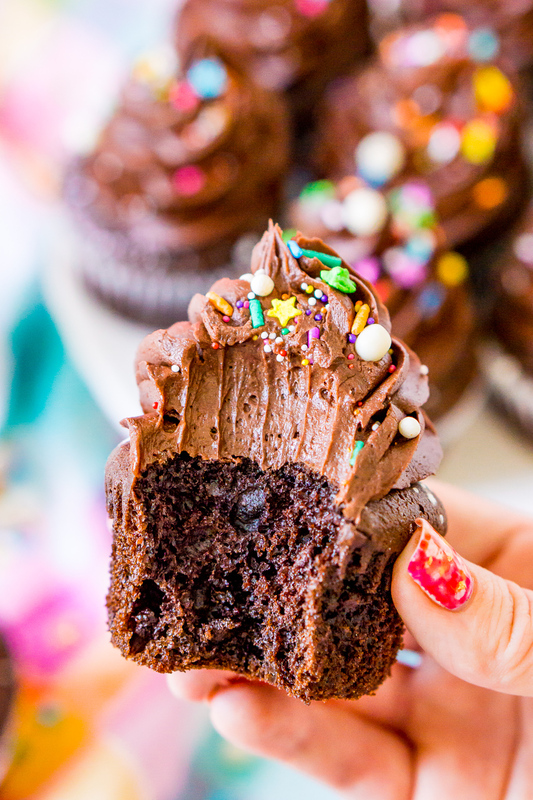 This Chocolate Cupcakes recipe is a total weakness of mine. I’ve made it dozens of time over the years and I’m excited to finally be sharing it with all of you! Technically, both parts of this recipe have existed on the blog for years, but never together. The chocolate cake base is the one I use in a lot of my chocolate cake and cupcakes, and I shared the chocolate buttercream frosting recipe with you several years ago as well. 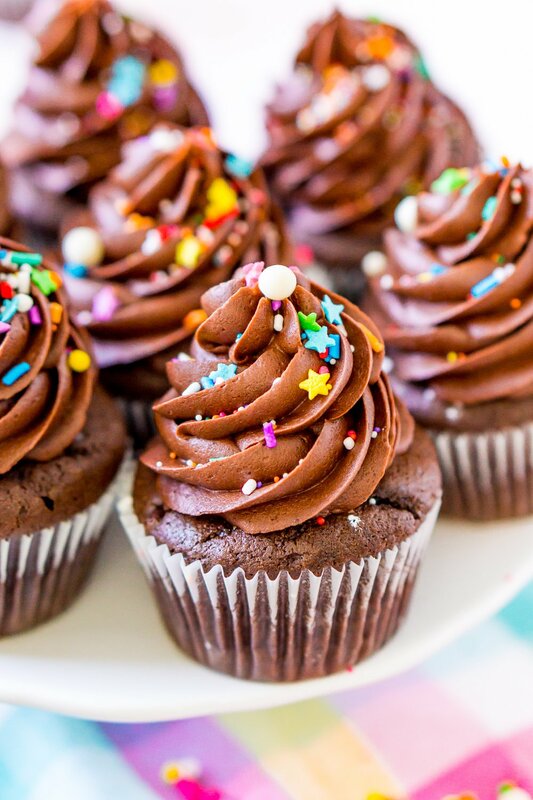 I know there’s something to be said for a simple vanilla cupcake, but my heart will always belong to chocolate. I just love how rich, tender, and silky this cake and frosting combination is and nothing is better than indulging in one of these cupcakes with a glass of cold milk. 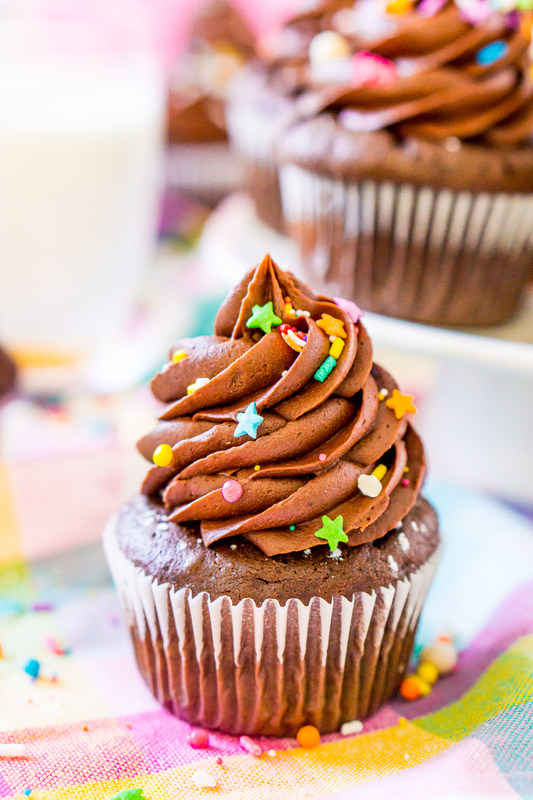 What Ingredients Are In Chocolate Cupcakes? 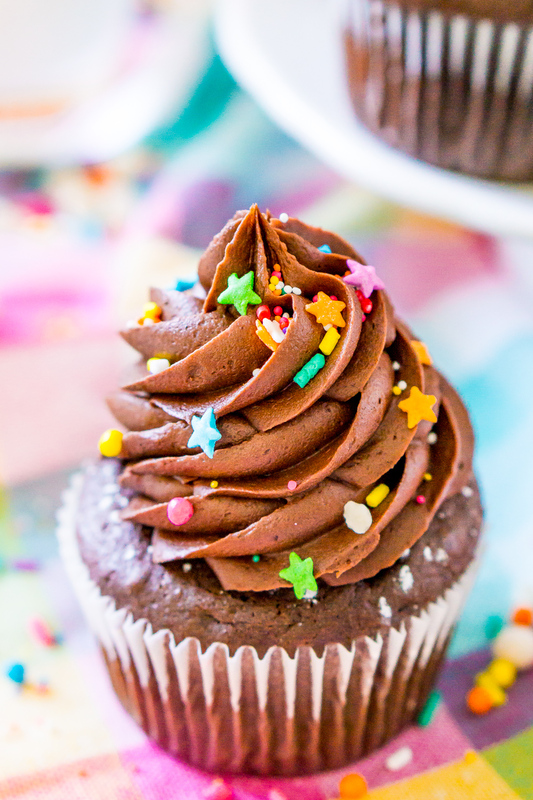 This Chocolate Cupcake Recipe is super simple to make! Begin by preheating the oven and lining a cupcake pan with cupcake liners. Then combine all of the cupcake ingredients in a large bowl or stand mixer and beat until fully mixed. Fill each cupcake liner with a scant 1/4 cup of batter and bake for about 20 minutes. Let the cupcakes cool for a few minutes in the pan before transferring to a cooling rack to cool completely. Prepare the chocolate frosting by whipped together the ingredients in a large bowl or stand mixer until smooth. Pipe the frosting onto the cooled cupcakes and top with sprinkles. 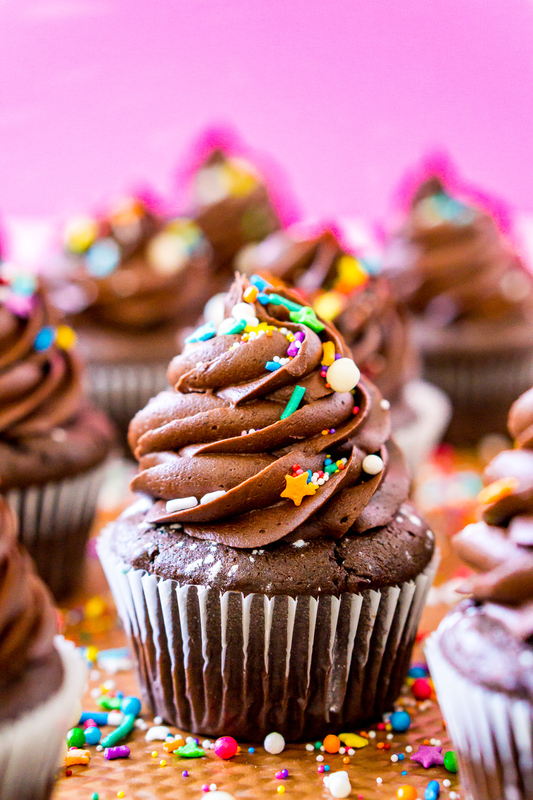 How Long Will Chocolate Cupcakes Last? They won’t, everyone will eat them right up! Okay, but if you do happen to have leftovers, these cupcakes will last for 2 days in an air-tight container at room temperature, or up to 5 days stored in an air-tight container in the refrigerator. Cupcakes taste their best when consumed within 48 hours of baking. Also note that while refrigerating extends the life of the cupcake, it can also dry them out. Can Chocolate Cupcakes Be Frozen? Technically, they can, but I wouldn’t recommend it. If you want to prepare the cupcakes themselves and freeze those and then frost them once you’re ready to serve, that is perfectly fine. 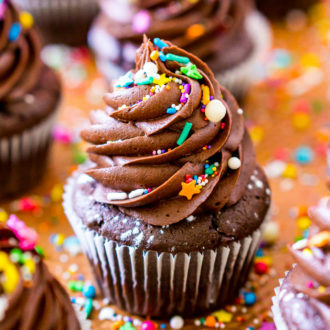 However, because of the design of cupcakes (piped frosting and all), this makes them harder to freeze because of extra steps that need to be taken. Check out this helpful guide on storing and freezing cupcakes. These Are My Favorite Baking Tools for Chocolate Cupcakes! Extra Large Star Tip: I use this top about 95% of the time on my cakes and cupcakes. I love the large swirls it makes and I think it’s easier to frost cupcakes with an extra large tip than a small one. Cupcake Pan: This is my favorite cupcake pan, it’s durable, easy to clean, and provides a nice and even bake. Measuring Cups: I absolutely adore these nesting measuring cups because they don’t take up a lot of room and they’re great for both large and small volumes in everything from baked goods to cocktails! Flex Edge Paddle Attachment: I don’t know where I would be without this thing, I use it ALL. THE. TIME! It makes the best whipped buttercream frostings and I really love how close to the edge of the bowl it gets. 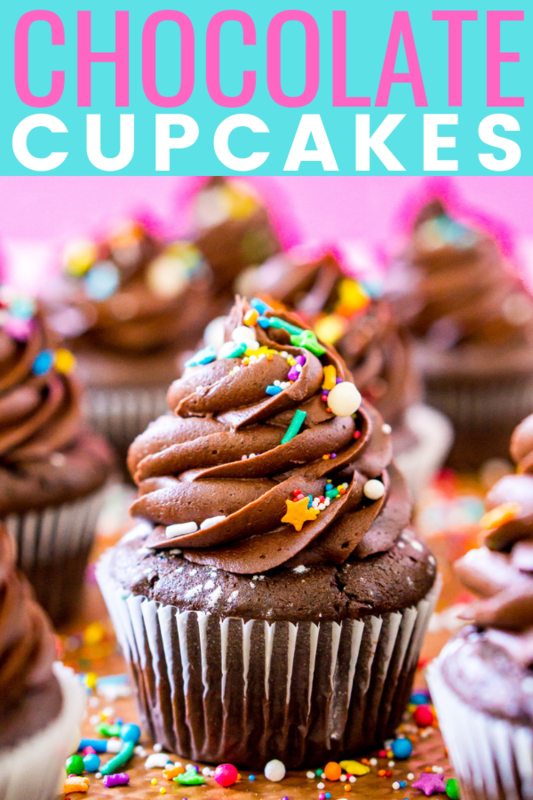 Try These Other Delicious Cupcake Recipes! These Chocolate Cupcakes are super moist and topped with a rich and decadent chocolate buttercream. Made with an adapted cake mix recipe, they're easy to make and perfect for parties! Preheat oven to 375 degrees F and line cupcake pan with liners and set aside. Add a scant 1/4 cup of batter to each liner so they're about ¾ full. 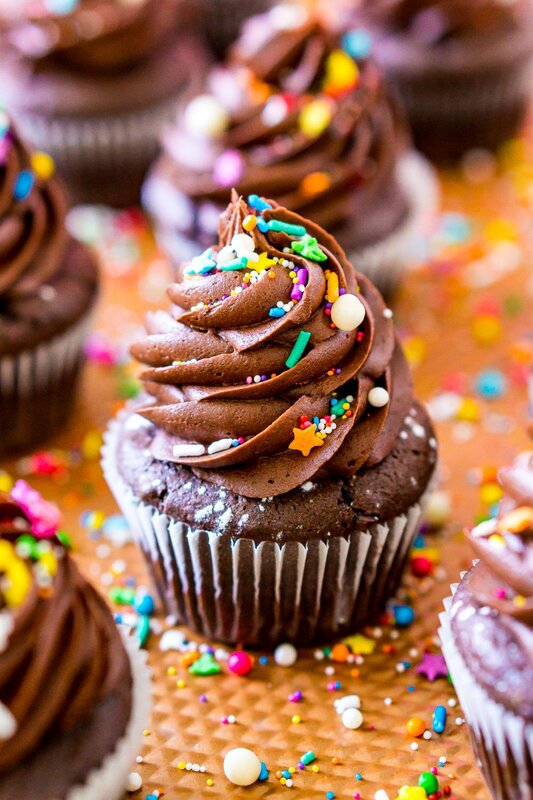 Bake the cupcakes for about 18-20 minutes or until a toothpick inserted in the center of a cupcake comes out clean. Let the cupcakes sit in the pan for a couple of minutes before transferring to a cooling rack to cool completely before frosting. While the cupcakes are cooling, prepare the Chocolate Buttercream Frosting as indicated in the recipe instructions. Pipe the frosting onto the cooled cupcakes and top with sprinkles, if desired. Scant means "just barely." In cooking, scant refers to an amount that's just barely reaching; in other words, not packed. When a recipe calls for a scant cup or scant teaspoon of something, don't fill the measuring cup or spoon to the top. Regular whole milk can be used if you do not have chocolate milk on hand. 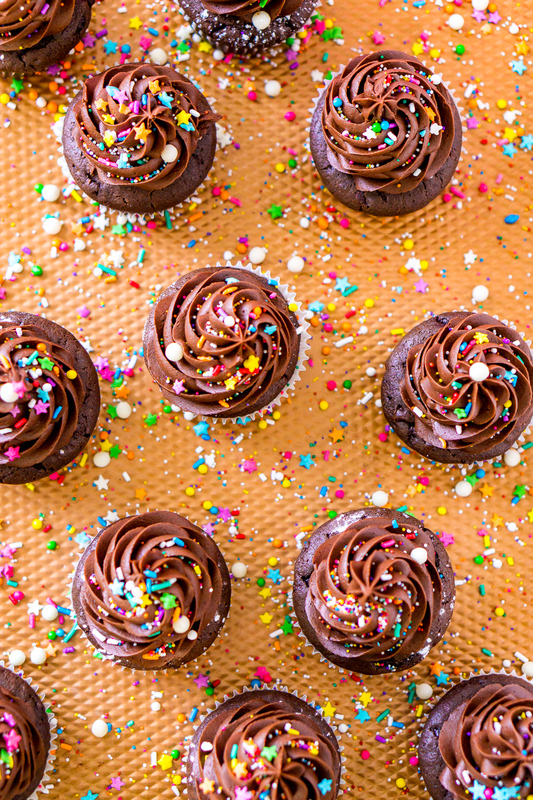 If you really want to make these cupcakes over the top, prepare a batch of instant chocolate pudding and core the cupcakes after baking and cooling and put pudding in the middle before frosting.